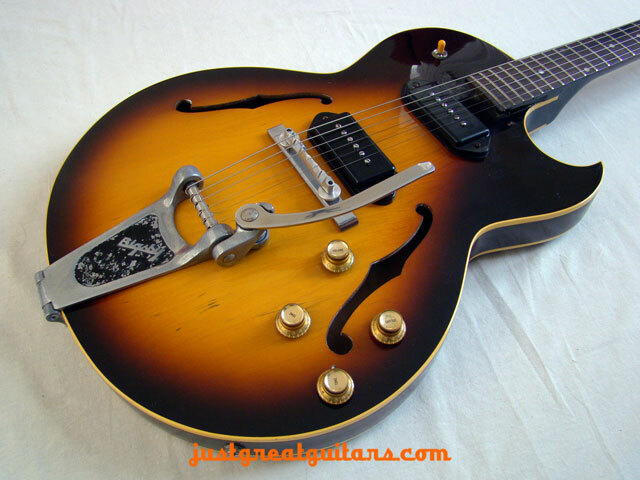 Whilst it’s no secret that we have a particular passion here at JGG for Gibson ES-125s, some instruments just stand out from the crowd and this particular guitar really caught our attention with its added Bigsby vibrato tailpiece. 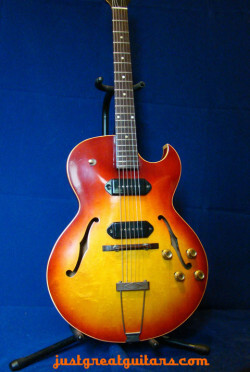 The guitar looks sensational with a Bigsby and it just oozes 60’s vintage glamour as a result. 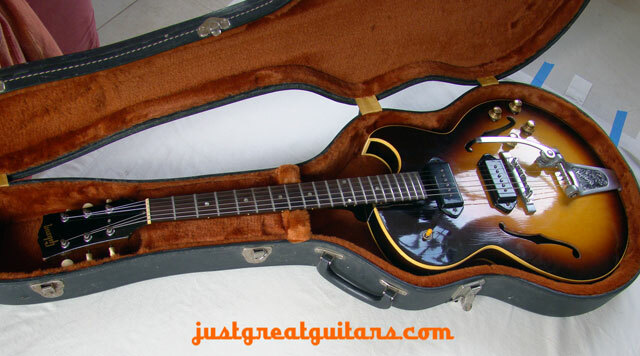 The rich smoky sunburst finish and twin P-90 single coils immediately catch your eye upon opening the case and as we discovered, this guitar really does play as good as it looks. 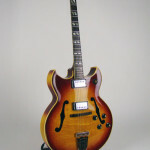 The thinline body shape of the ES-125 TDC makes it a very comfortable guitar for both composing on the sofa at home or no-holds-barred live work and it won’t give you the backache some guitars do after an hour or two on stage. 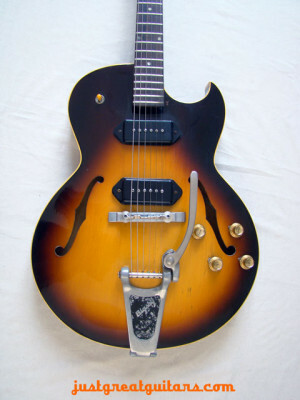 Whilst it’s no secret that we have a particular passion here at JGG for Gibson ES-125s, some instruments just stand out from the crowd and this particular guitar really caught our attention with its added Bigsby vibrato tailpiece. 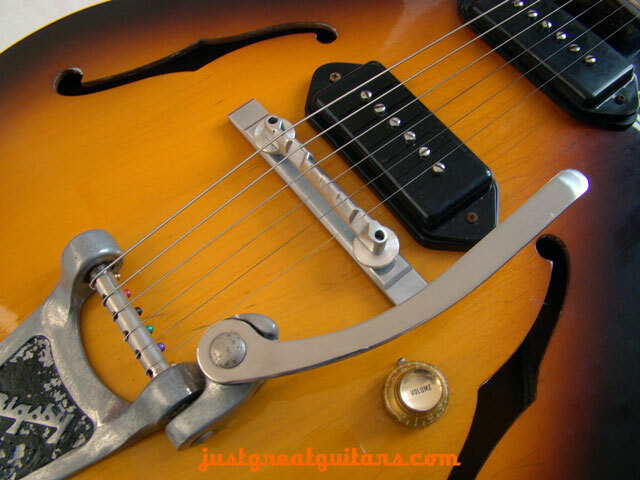 The guitar looks sensational with a Bigsby and it just oozes 60’s vintage glamour as a result. 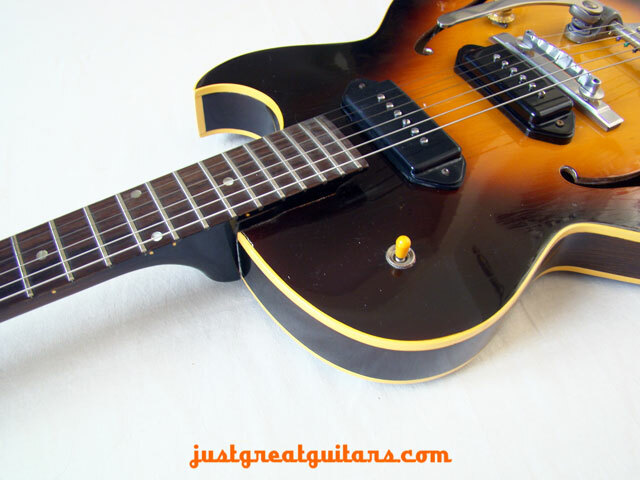 The rich smoky sunburst finish and twin P-90 single coils immediately catch your eye upon opening the case and as we discovered, this guitar really does play as good as it looks. 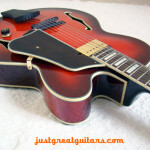 The thinline body shape of the ES-125 TDC makes it a very comfortable guitar for both composing on the sofa at home or no-holds-barred live work and it won’t give you the backache some guitars do after an hour or two on stage. 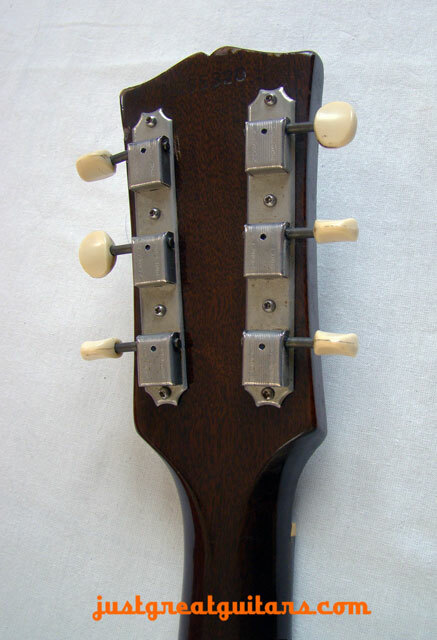 The single piece mahogany neck is beautifully finished throughout and with plenty of life left in what we believe are the original jumbo frets. 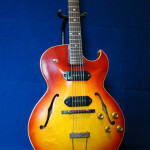 The Florentine cutaway allows very comfortable access to upper registers on the fingerboard and chords and single-line soloing are all a treat to play. 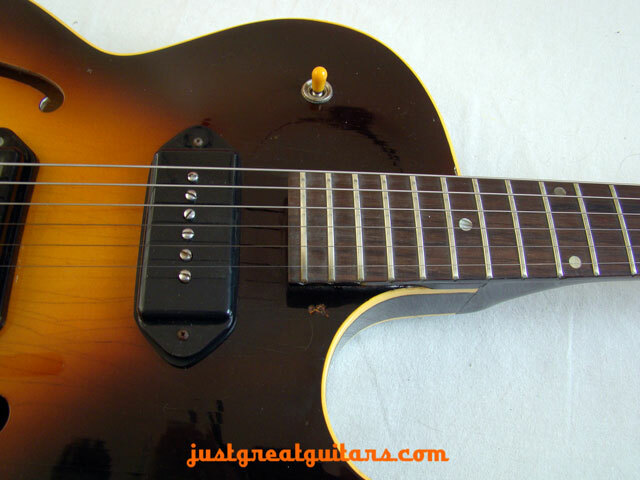 This is a fairly loud guitar with a great deal of presence even without being plugged in, however once you’re amplified, you can hear what all the fuss is about with the classic P-90 sound. Everything from a raunchy blues growl to the darkest of jazz tones is possible here and it feels very expressive to play. 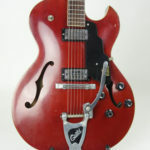 The guitar wouldn’t have had the Bigsby as an original feature so somewhere in its history someone has had this professionally added on and it’s really brought a new dimension to the guitar and the P-90 sound. 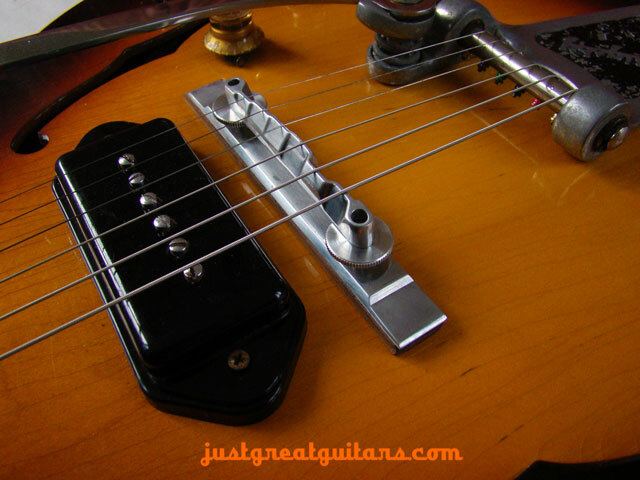 In conjunction with the roller bridge, the Bigsby vibrato unit makes getting those classic 60’s guitar ‘twangs’ a breeze. 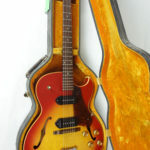 Overall the guitar is in very clean condition throughout with no belt buckle rash on the back and only a couple of dings in the finish. 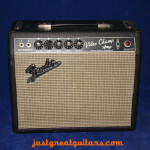 The included case is non-original but lined and of good quality. 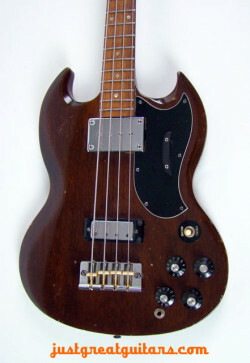 This is a real vintage gem of a guitar. 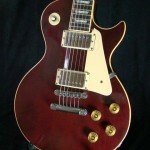 You get those classic P-90 tones, wonderful Gibson craftsmanship and playability alongside that mighty Bigsby! 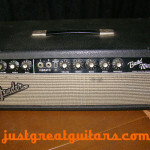 You can’t ask for much more than that in a guitar. 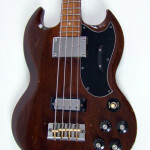 I first hesitated to buy it, because your description was so very lyrical that I did not trust it (it sounded too good). 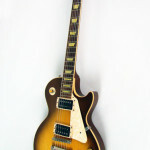 But indeed, it's all true: it's a fine & fabulous guitar. A joy to look at and to play.